Grenadier, «Marquis de Chasteler» regt. Dear friends! The DiShow2018 annual modelling contest is completed! We are glad to congratulate our winners and publish the results list. We are glad to inform that the DiShow2018, 16th annual scale modelling contest performed by our partner site Dishmodels.ru with our support, is now going on! Contest gallery waits for your works! Dear friends! The DiShow2017 annual modelling contest is completed! We are glad to congratulate our winners and publish the results list. We are glad to inform that the DiShow2017, 15th annual scale modelling contest performed by our partner site Dishmodels.ru with our support, is now going on! Contest gallery waits for your works! 18.05.2017 Results of DiShow2016 contest published! Dear friends! The DiShow2014 annual modelling contest is completed! We are glad to congratulate our winners and publish the results list. We are glad to inform that the DiShow2016, 14th annual scale modelling contest performed by our partner site Dishmodels.ru with our support, is now going on! Contest gallery waits for your works! We are glad to inform that the DiShow2015, 13th annual scale modelling contest performed by our partner site Dishmodels.ru with our support, is now going on! Contest gallery waits for your works! Dear fellow modellers, we're informing you that our "Juniors" section in gallery were closed on November, 1. Since that day, all novice level works will be published by authors at our forum. Please don't hesitate to use online translators and publish your works! Dear fellow modellers! The DiShow2013 annual modelling contest is completed! We are glad to congratulate our winners and publish the results list. 10.10.2013 New theme contest «The Great War '3» started! Dear fellow modellers! We're glad to announce the new contest, dated to the 100th anniversary of the World War I. Costest is performing with our frends, DishModels.ru with our support. We're waiting for your works! 04.12.2012 Our theme contests were prolonged! Glad to let your know that our theme contest were prolonged. End of "The Day of Borodino" contest was moved to January 8, and the end of "Gods of War" contest - to March 15, 2013. It's a good chance to accomplish your WIPs and even bring us a brand new works! We are glad to inform that the DiShow2012, 10th annual scale modelling contest performed by our partner site Dishmodels.ru with our support, is now going on! Contest gallery waits for your works! 07.09.2012 New theme contest «The Day of Borodino» started! Dear fellow modellers! Today we starded our 4th theme contest, dated to the 200th anniversary of the Battle of Borodino, and dedicated to the all wars of Napoleonic era. We're waiting for your works! 15.06.2012 «Gods of War» theme contest started! Dear friends, we are proud to declare the start of our 3rd theme contest dedicated to the artillery! We wish perfect works, fair competition and well-earned awards. 14.05.2011 "War in the Desert" contest is completed! Dear friends! Our North African theme contest is completed! We are glad to congratulate our winners and publish the results list. Dear friends! Both our forums may be temporary unavailable due to engine upgrade on the Easter weekend (April 23-25). After the upgrade we'll close English forum, but it will be available again as part of the Russian forum in the nearest future. Thank you in advance for the patience! Here we are! Christmas is coming and we extend our design collection in the online-shop. Today's mass update includes for brand new designs with new wonderful characters: Vasiliy, Paul, Julius and Trofimych. Hurry up to order your Christmas presents in time! Dear friends, we have improved the number of RSS feeds available to you on this site. Now there is a possibility to follow the latest updates in gallery and workshop in you favourite RSS reader. Additionaly we have developed several nice features to track the comments and particular author activity inside the feed. The details are discussed on our russian forum (key points are also translated in English). Enjoy it and give us your feedback in any case! Small article explains easy and cheap way to make antislip surface with the example of Abrams tank model. 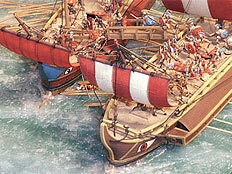 Detailed article about building of diorama of the same name published at our site 3 years ago. Detailed article about building of this spectacular and impressive diorama, full of author's know-how on diorama making techniques. It's worth reading! Recent large scale plastic figure by MiniArt was heavily modified by author with use of knive and putty. Must see! Step-by-step article about making of castle section with use of foam styrene. 8th Pennsylvania Cavalry Battle of Chancellorsville, May 2nd, 1863.
Review of new kit by Master Box from ther American Civil War Series, the very dynamic scene of cavalry charge.